The U.S.-led bombing of ISIL targets inside Syria has recently intensified as Pentagon officials professed a military mission that could potentially last several years. On Tuesday, American and other coalition forces, consisting of five Arab nations, launched more than 200 strikes on Islamic State targets, extending the miniature campaign to a third night. US air strikes against targets inside Syria are being concentrated on the various oil refineries and infrastructure that is currently controlled by the militant group in an apparent attempt to cut off ISIL’s main source of income. 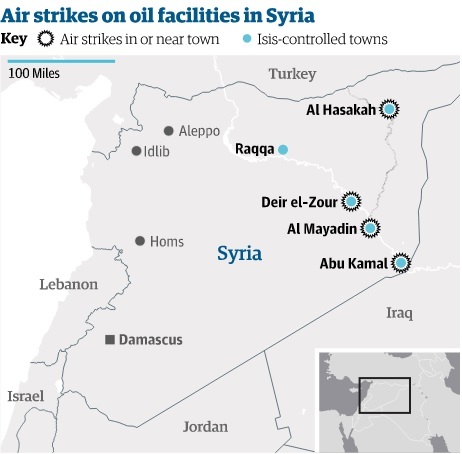 The group previously captured most of Syria’s major oilfields earlier this year. ISIL is believed to be trading the oil on the black market for equipment, supplies, and money in order to continue its operations. It is thought to have control over 11 oilfields that reside in both Iraq and Syria, contributing to a fairly large income equivalent to over three million USD a day in oil smuggling and other activities. The U.S. also launched separate unilateral strikes in Syria’s north, against an Al-Qaeda-linked group, near the Turkish border close to an area where tens of thousands of Kurds have fled in hopes of escaping not only the militants tied to the Islamic State group, but also the air strikes being committed by the coalition forces. The attacks on a series of oil installations around the town of Mayadeen, in the eastern province of Deir el-Zour, reportedly killed 19 people, including five civilians. Other airstrikes were aimed at checkpoints, compounds and vehicles in ISIS-held territory spanning from the northern area of Syria along the Turkish border to the eastern provinces along the Iraqi border. President Barack Obama has been heavily pressuring the diplomats who are attending the United Nations General Assembly located in New York City for aid in the conflict against ISIL. That effort seems to be effective, with Belgium announcing it will likely participate by providing air support and the Netherlands promising a group of fighter planes. Obama, while addressing the United Nations, asked the world to join together to combat the dangerous militant group ISIL and followed the request with a guarantee of renewed military force against them. “The only language understood by killers like this is the language of force, so the United States of America will work with a broad coalition to dismantle this network of death,” said Obama.